The problem however with being an "amateur photographer", is you need a way to CARRY all that gear, and if you're like us, you need a way to carry it that one, DOESN'T break your back; two, fits UNDER a plane seat; and three, fits all your gear PLUS personal stuff cuz there is no way in HELL we're carrying TWO carry-ons EACH. The other problem is as hinted at above, we have a TON of gear, so we needed TWO bags - one for him, and one for me. And rather than searching around for something that worked for HIM vs a DIFFERENT something that worked for ME, our goal was TWO somethings, both with enough compartments for ME to separate my contact stuff and magazines from my camera gear, and enough space for HIM to carry his multiple GIGANTO sci-fi books, his GAZILLION gadgets he cannot travel without, AND his camera gear. What we ended up buying (x2) is the Lowepro Mini Trekker AW Backpack (Black). This bag not only met ALL the criteria above, but did so with a waterproof cover* that probably ended up SAVING our cameras on what turned out to be a VERY scary boatride while in Thailand. 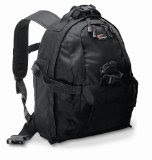 The Lowepro Mini Trekker AW Backpack (Black) not only has multiple compartments and zippered areas for separating your personal stuff from your camera gear, but it has ADJUSTABLE insides. Meaning, if you're like us and own two bases PLUS multiple lenses (all in varying widths and lengths such as a 10-16, a 75-300, 17-85), the need to TIGHTLY pack those lenses, ensuring they STAY in place during travel, is key. This backpack does that, perfectly. And while small in size, the Lowepro Mini Trekker AW Backpack (Black) also won me over with great bonus features such as MINI pockets to store things as small as a camera battery that you really DON'T want to be digging through a big pocket for; a tripod pouch to hook our tripods into so we don't have to carry them SEPARATELY; padded shoulder straps to save me from the WEIGHT I can sometimes throw INTO this bag; and all sorts of stretchy adjustment strings to hook additional things onto your pack - things like a baseball cap for the husband and his often sunburnt head. The only thing I'd say this bag DOESN'T have is enough space for my new laptop. If we'd bought one of those MINI laptops, there'd be no problem at all, but regular size laptops? Well, they call for something like the Lowepro CompuTrekker AW Camera Backpack - the bag I really want to upgrade to now that I'm a laptop owner. Maybe for Christmas? Hint hint? But putting it out to all of you, what's the one must-have feature YOU look for in a camera bag? Do you have one you own and love? If I were to get a lovely Christmas upgrade, would I be happier with something else? *Note: The cover is only a "cover", as in it wraps OVER the front of the bag only and protects it from splashes and rain. It will not save your camera if, for example, it falls OUT of the scary boat and into the ocean. If it helps you take the great photos you did on your Asian trip, I'm all for it. May your dropped hint be picked up.